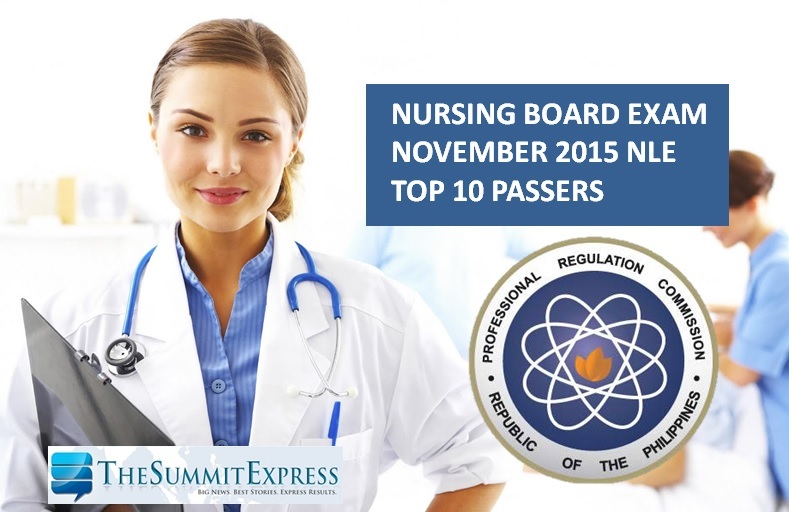 On this page you will find the list of top 10 passers (topnotchers) for November 29-30, 2015 NLE (Nursing licensure exam) also known as Nursing board examination as the Professional Regulation Commission (PRC) officially released results in 24 days after the exam. PRC on Friday, Januaary 8, 2015 announced that 9,114 out of 18,500 (49.26%) passed the NLE. Those awaiting the results for NLE may view here the name of successful examinees who garnered the highest places for November 2015 NLE board exams. This includes the rank, school and average rating. November 2015 NLE was conducted in various testing centers nationwide: Manila, Baguio City, Laoag, Angeles, Cabanatuan, Cebu, Dagupan, Davao, Iloilo, Legazpi, Lucena, Pagadian, Tacloban, Tuguegarao, Zamboanga, Cagayan de Oro (CDO) and Bacolod. In May 2015 NLE, there are 96 topnotchers who occupied the Top 10 list. Benedict Rey Montas Serrano of Bicol University - Legazpi topped the board with 86.40 percent grade.